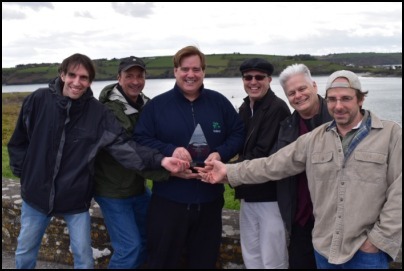 Boston, Massachusetts  Celtic Radio is pleased to announce the winners of the 2015 Celtic Radio Music Awards. This Music Awards program was created to promote exceptional Celtic music across 6 categories of music. Nominations for this award are made throughout the year by listeners and members of Celtic Radio. After a careful screening process, which is based upon listener nominations, ratings, requests, and other radio statistics; we select 3 songs across six categories of music for voting: Celtic Rock, Traditional, Jigs & Reels, Bagpipes, Roots Traditional and Contemporary music categories. Voting begins on January 1st of each year and ends on Celtic Radios popular St. Patricks Day celebration. Winners receive recognition of this prestigious award through the induction into the Celtic Radio Hall of Fame and permission to use the Celtic Radio Music Award banner on their website. Our awards program was expanded in recent years to include the Celtic Radio Album of the Year award. This award is given to acknowledge musical creativity, extraordinary work and exceptional talent on an album which provides recognition of outstanding contributions to Celtic Music. Winner of this award category receives permission to use the Radio Music Award banner on their website, receives the esteemed and prestigious Crystal Glass Engraved Celtic Radio Music Award. Through the Celtic Radio Music award program our goal is to promote and recognize exceptional artists who display high standards of excellence both on the stage and off the stage and who have made significant contributions to Celtic Music throughout the world. Pictured is a sample of the official music award package that Get Up Jack will receive from Celtic Radio. A 10 inch Crystal Glass Engraved Celtic Radio Music Award is our yearly presentation for the recipient of this prestigious award. Mounted on a black embossed plate, this award is presented in recognition of the Celtic Radio Album of the Year. "As one of the most interesting names within the contemporary Irish music scene, it's not a surprise that we decided to award this group of talented musicians as winners of our 2015 music awards. When we look at great Celtic music, we aren't simply looking to judge execution, productions, recording and musicianship: the spirit that goes into the performances is a key element of the work of any great Irish folk artist or group out there. Get Up Jack are a rare breed: these guys breathe, live and experience their music from a very deep and personal place. They are also able to translate their enthusiasm and passion in ways that it becomes energy and fun for the audience, live or in the recording studio. Combining charming retro aesthetic with the timelessness of folk and the punch of modern productions, Get Up Jack set out to ignite the Celtic music scene with massive doses of charisma and liveliness, carrying the torch and continuing in the tradition of influential masters of the genre, including The Dubliners, The Pogues or The Wolfe Tones, just to mention but a few. The band's songs are able to fill the room with joy and happiness, thanks to the band's great dynamics and powerful presence. The line-up showcases an incredible chemistry and a diverse set of instruments that allow them to capture the subtle nuances of the genre, while keeping their sound remarkably honest, fresh and direct. Multi-instrumentalists John Haggerty and Crick Diefendorf, guitarist Mike DeAngelis, drummer Scott Apicelli, as well as bass player Tom Pirozzi and harmonicist Doug Johnson are all seasoned veterans with massive studio and stage experience - a wealth of musicianship that is fully being used to the benefit of the Get Up Jack project. The more we listen to the music of Get Up Jack, the more we feel a great connection with that old saying: why fix it if it aint broken? These talented musicians have demonstrated that they arent just able to carry the flame and continue in the footstep of those artists who brought Irish folk musical to the masses, but they also managed to create their own legacy in the process, creating a unique connection with the audience that is strongly based on their personality and powerful performance value. Ultimately, Get Up Jack excels at bringing together the two elements that define Irish music: the strong communality of it, and the timeless values and storytelling." 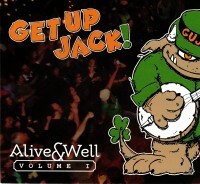 Congratulations to the 2015 Celtic Radio Album of Year award for Get Up Jack's "Alive and Well Vol. I" A 10 inch Crystal Glass engraved Celtic Radio award is being created by our vendor and will be mailed to Get Up Jack with compliments from our many Celtic Radio supporters that make this award possible! Slainte! - Celtic Radio Music Awards Committee." View 2015 Nominations and Results! Click to Visit the Hall of Fame! To nominate a song for 2016, please contact us with the details of your nomination.